Whatever color your thumb, you're sure to find success with the Lechuza Cubico Self-Watering Indoor/Outdoor Planter. Constructed of highly durable polypropylene, this planter is shatter-proof, lightweight, and UV-resistant. It has a matte finish in your choice of colors and is available in an assortment of sizes. Thanks to an easy-to-remove liner, planting is easy. Best of all, this planter has a signature irrigation system that ensures your plants are properly hydrated for up to 12 weeks. A water level indicator shows you when it's time to add more water. Also included with this planter is LECHUZA PON. This specially formulated plant substrate separates your potting soil from the reservoir, aerates the roots, provides your plant with nutrition, and helps regulate water supplied to your plants. 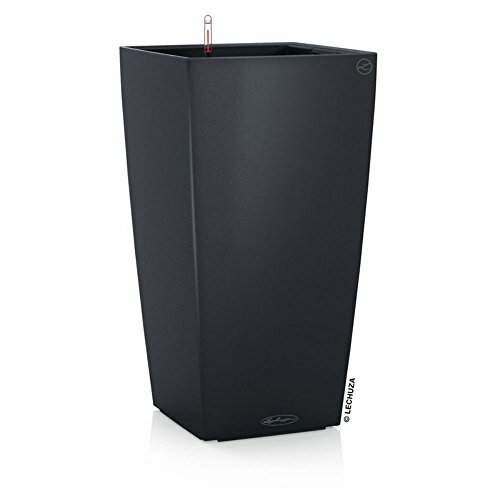 As an indoor and outdoor planter this Cubico is outfitted with a drainage plug to allow removal of excess rainwater when used outdoor. How the Lechuza Self-Watering System Works This modern, cube-inspired planter uses a self-watering, sub-irrigation system to nourish your plant. The included separator piece forms a reservoir in the base of the removable planter liner. A supply shaft with water level indicator runs along the inside edge of the liner, making it easy to add water and liquid fertilizer while maintaining complete watering control. A layer of LECHUZA-PON granulate drainage material lies on top of the separator and regulates the amount of water your plant receives - no more rotten roots! After potting your plant with soil on top of the pon drainage material, you will need to water the plant from above through the soil for the first 12 weeks. Each time you water, fill up the supply shaft, too, and don't forget to add liquid fertilizer every other watering. After that, the plant roots will have grown deep enough to soak up water from the reservoir below.